My fav TAYLOR SWIFT songs - begin(ning) again - or the end? Thread: My fav TAYLOR SWIFT songs - begin(ning) again - or the end? 3 songs from the text above have not made the Top 50 btw. Cringe-worthy maybe, but sweet nonetheless. 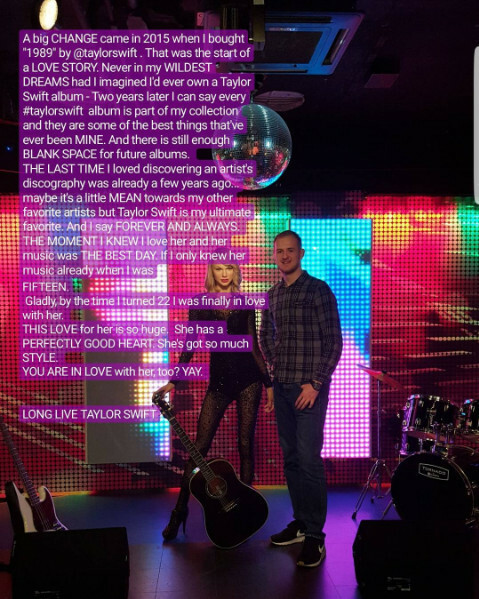 Is Taylor really your all-time favourite, though? How long did it take to pick the order? Black Panther is now the most popular Avenger; even bigger than Iron Man! Well, to be quite honest, my #1 favorite artist changes every 2 or 3 years lately. When I first started listening to music, it was Madonna (2005-2011), then P!nk (2012-2014), Alicia Keys (2015/first half of 2016) and at the moment it's Taylor Swift. However, I have never listened to an artist that much in a calendar year than I did listen to Taylor in 2017 (almost 10k plays!). So that probably means something. It's still not finished, I have to think about certain positions, however the Top 10 is already done. It's never easy to rank songs tbh because maybe a few days later you listen to a song you place in the bottom half but suddenly love it so much you'd rank it way higher. happens to Taylor's songs so often that I discover a song that I'd never cared for before. That's why it only starts early September. the first song to appear on my countdown is the lead single off her "RED" album. The "crazy" song title put me really off back in 2012 and I didn't feel to check it out. however, it was probably one of the first popular TS song in Germany. I love the video, it's crazy and funny. However, it's still my least favorite lead single by her. it's not bad but far from her best in my honest opinion. but i fell in love with it back in 2014 when i had my first break up. this song was exactly what i was feeling at that time..
^RED was my second Taylor album, ofc I only knew WANEGBT and IKYWT. They were my favorites from the album but then I digged a little bit deeper into her discography. I think it was a great way to start the era, though. I love the spoken parts here. I actually fell in love with Taylor due to her songs she did for The Hungers Game back in early 2012 so when WANEGBT was announced I was really curious. On first listen I thought she'd totally ripped Avril off so I was super pissed I still loved the song though and from that moment decided I should probably follow her as an artist. well she kinda did, didn't she? but not in a negative way. i wish i had started following her with that era, too (or even earlier, I remember watching the "Mine" video back in 2010). few more positions coming this evening. I still love this song, she really transitioned here and took a chance. To be honest, this was her make or break moment, because there was no country star who really made that big risk, LeAnn somewhat did it but it was at the time that there was already low demand for her music. i agree! i can only speak for myself but i am happy she chose that route.... I adore pre-RED Taylor and the albums but I love the "current" Taylor just as much! And it's crazy how much demand there is for Taylor's music. I am happy she finally seems to conquer Europe as well. the first song from a special/re-release/deluxe/platinum edition! How did this not appear on the standard album is a mystery to me! i love the lyrics, it's typical taylor swift for me. fun fact: it's said to be taylor's favorite song on the platinum edition. she already began writing songs for 'SPEAK NOW' but some songs wouldn't fit the overall theme of the next album, that's why certain songs were chosen for the platinum edition of her grammy-award winning album "FEARLESS". the song is self-penned by her using a banjo. such a feel-good-vibe song! the second song from RED dropping out at #48. "GIRL AT HOME" is a song that certainly had to grow on me. however, i think it's a solid song. i picture a live performance of it with taylor sitting on a chair and playing the guitar herself of course in a RED dress. Her fan base continues to grow, it's crazy! "We Are Never Getting Back Together" and "Shake It Off" have to be the most annoying songs I have ever heard (and no, that's not an exaggeration) , that's why I'm glad that one of these tracks is already out. I've just listened to "Jump Then Fall" and it's not even bad! It's a shame it's on the re-release because I even own "Fearless" (bought it in a weak moment). I agree, it's such a feel good track and it suits her song! Definitely one of the best songs by Taylor I have heard! Thank you for introducing this track to me! "Girl At Home" is a bit of a non-event, right? But it's cute. Maybe, I need to finally listen to "Red" (but the singles put me off, tbh). which is also kinda good (for me - I am from Germany), hoping for a bigger tour schedule in Europe next year! Thank you! Her discography is full of beautiful gems , the singles from her album are usually amazing but the album tracks are just <3. I kinda agree with you, WANEGBT can be annoying, however "Shake It Off" is definitely one of her greatest moments ever! I even put that song on my work out playlist, it is SO Good and gets me motivated. You're welcome, I think it's always good to know a few songs besides the singles to get a better picture about discographies. meanwhile stream her new song "...READY FOR IT" on SPotify / Youtube / Tidal / Apple Music. "ours" is a cute ballad which showcases her sweet voice on a true-to-life song. it's cool that it was a single, however there are stronger album tracks left on "SPEAK NOW" that should've been released instead IMO. one of the weaker tracks on her best album, however still a good one. especially a great concert opener, love its performance on the SPEAK NOW WORLD TOUR. What I especially like about this song is the line "DROP EVERYTHING NOW!... MEET ME IN THE POURING RAIN.."
I wish there was a "real" video for this song. Those concert videos are cute and it's good to see some more from the tour but I usually prefer a real music video. "We Are Never..." would probably make my T-Swizzle Top 10. The chorus is so big! "Jump Then Fall" is an underrated gem. It was my favourite song on the Platinum edition for a long time, but I think I prefer "The Other Side of the Door" at this point. Hmm...I'm not a big "Girl at Home" fan. "Ours" is a gorgeous gay anthem. For me, it is probably the most underrated Taylor Swift song. It would make my Top 10 comfortably. I'm on my guard for the rest of the world, but with you, I know it's no good. It took me quite some time to grasp the magic of this one, but it's one of my favourites from her. Definitely Top 20 material for me. I'm going to pay close attention to where you rank "Mine" and "Enchanted," 'cause you're offing some pretty big ones early on. Sparks fly is my fave from SN it would clearly make my top 5.. It does have a quite remarkable chorus - it's so addictive! Aw! :( I think it's really cute. There is at least one big surprise on this countdown - a certain single of her hasn't made it to the Top 50. There is another big Taylor Swift song which I only grew to love in the last few days before I compiled the list. It's not as high as other songs though. Let's see it it's "Mine" or "Enchanted".